The weather here has been crazy. We are used to below-freezing temps even in the afternoon during this time of year, but it has been so warm. Like, go-outside-and-ride-your-scooter-without-a-jacket warm. This crochet hat almost feels like false advertising. 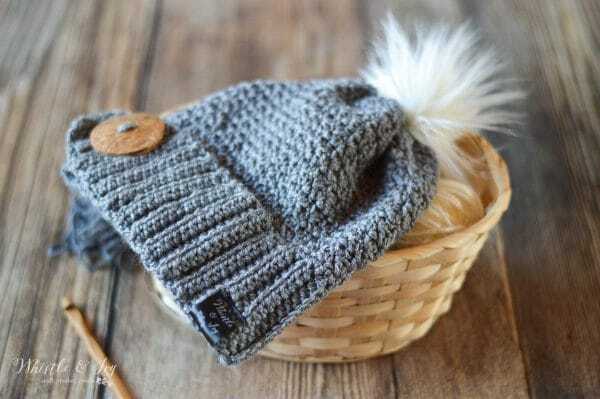 However, I think that there is someone, somewhere who needs to bundle up (and most likely it will be us in April, because Utah weather is like that…), so this Snow Bunny Crochet Hat may just be the perfect crochet hat for a cold soul! Isn’t that white fur cottontail pom-pom so cute? I just love the grit stitch. It has such a lovey and unique texture (that is easily achieved as well). I made my Baby Hooded Cowl with the grit stitch and it looks so pretty in that soft, silky yarn. It’s one of my favorite stitches. The beautiful texture is achieved by alternating the sc first then the dc first so the stitches alternate their direction a bit. The effect is very pretty. Begin with a long tail. Ch 14. Repeat row 2 until your piece is 18″ – 19″ long. You will get this measurement by gently stretching your band and measuring the length, not the pre-stretch length. You want the hat to be snug and due to differences in yarn stretchiness, I am not providing a row count. Instead, use your measuring tape. Place a stitch marker. Repeat row 2 for another 15 rows. Fold the band over until the flat end lines up with the row you marked with a stitch marker. Using your long tail from the beginning, sew in place with a length of yarn and your darning needle. 1. Flatten the band so the seam that connects the band is in the front. The flap will lay across the seam, like it’s wrapped around, not fold backward itself. Join your yarn directly opposite of the seam on the back. Working from the outside, ch 1. Sc around the top of the band, working 72 sts. Work on either the top or the bottom of the band, depending on which way you want the button and flap to lay. Be sure not to work through both the band and the flap, just work around the main band of the hat. Note: the keep your seam from shifting, you can begin every other row with 2 sl sts, and this will keep the seam more straight. 4. – 17. Repeat rows 2 and 3 respectively. Note: you can work extra or fewer rows here to adjust the slouchiness of your hat. 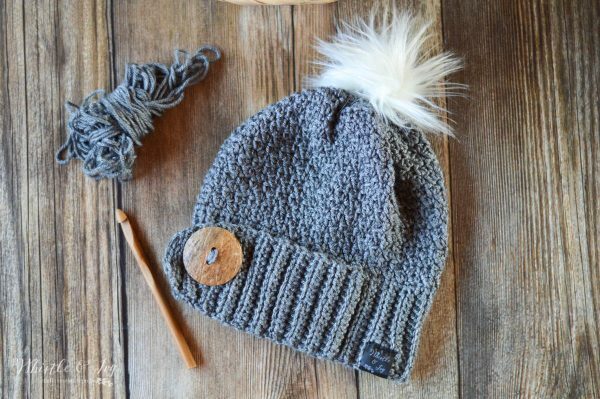 Using a length of yarn, sew a loose running stitch across the remaining hole at the top of the hat and cinch closed. Tie a firm knot and clip ends. Attach a pom-pom to the top. Sew a very large button on the hat brim under the button hold of the flap. I named it the Snow Bunny Crochet Hat, and I thought the white fur pom-pom looked perfect on top! I make my own and they are easier than you can imagine, see a tutorial here. Love this Snow Bunny Crochet Hat? Subscribe! Will you ever make a baby versionnof this pattern? Possibly! Are you wanting one? I want one. I work for a surrogacy agency and I make hats for the new babies. I would love to make this to give as gifts to the new parents. Hi! Thank you for this pattern. I was wondering, what method should I use to join my yarn to the band when I am ready to begin the hat body. Thank you! You can simply slip stitches and start with the loop on your hook. Where did you buy your button? Hm, I don’t recall, I am sorry! It was just in my stash. Yes, make a band that measures 17-18″, then place a stich marker and work an additional 15 rows after that. How can you make this into a messy bun hat? Yes I think you could. You would need to work fewer rows at the top and then work some decreases. Right, it’s a bit weird because you are working into the side of the rows. If you only got 50, then I would go back and work an increase about every 8-10 sts or so. Where you say “repeat row 2 for another 15 rows” can I make it 7 rows instead of 15? The band already fits me perfectly and if I keep going it will be too big. Please help!! Perfect! It should fit perfectly at this point. The extra rows are for the part that folds over. Do i have to use a pom pom? I would love the hat without it. Lovely thank you for sharing. it looks so cute, thanks for sharing! 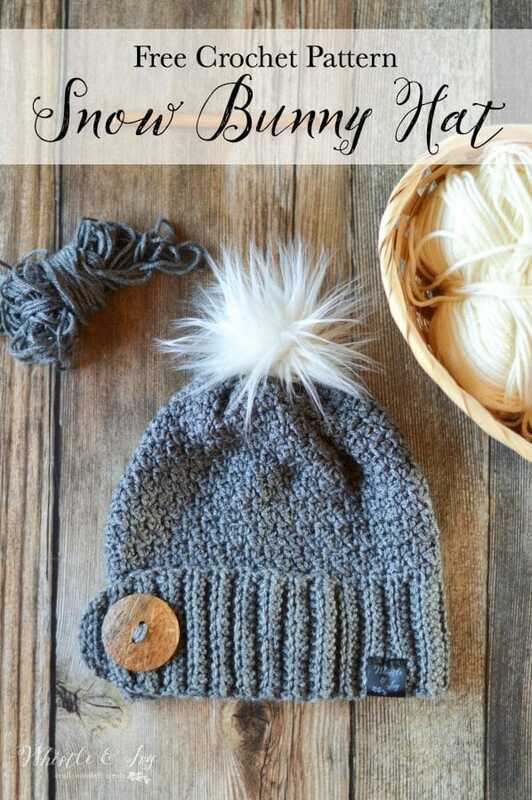 Yes, but you will need to make adjustments because the bulky yarn will make your hat quite a bit larger if you work the exact pattern. You may have mentioned this somewhere, but is this hat pattern adult sized? I love your crochet!! Your talent is amazing! I was wondering how I could make the Snow Bunny hat in a toddler-child size to have matching hats for me and my daughter? To make it smaller, you can make the brim about 16″- 17″ (using the gentle stretchy measuring method described in the post), then work several more rows to make the flap. Then just make sure the count of the body is even, and make the hat a couple inches shorter. Very easy to size up or down! Hi, I did a comment a while back (btw this has nothing to do with the hat) (but I do like the hat) about purse patterns for operation Christmas Child, but I forgot where I commented it! Can you either please tell me where to find it (if you remember responding to it) or re-respond here please? Thank you! Hi Alathia, you can find all my hat patterns by searching “hats”, but don’t have any washcloth patterns, sorry! Ok thanks! That Will help so much. Oh, and I was also wondering if you had purse patterns. Ok, I’ll check it out, Thank you so much! This was fun to make and pretty easy to follow. I love the amount of stretch it has, and I used a nice soft wool. So nice!! Just have to get a button for it and put the Pom Pom on! You keep coming up with the cutest ideas. I love everything you do!!! I’m slightly confused where it says to join the yarn directly opposite of the seam when starting the hat body. 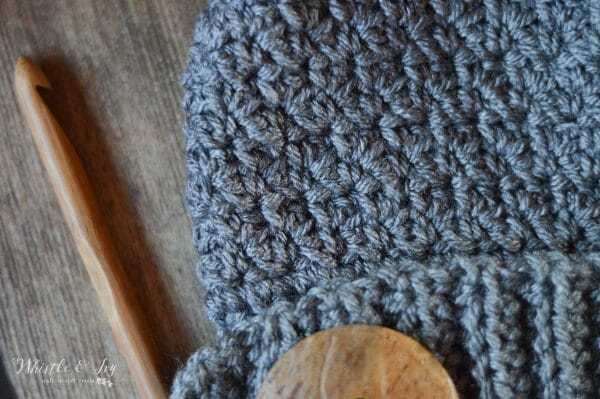 You just want the seam in the back of the hat, so if the brim of your hat is a circle, find the side with a seam (where you sewed the overlapping part) and begin on the opposite side. Are the stitches being worked in the sk stitch space starting with row 2? Or am I to work the stitch into the top of the previous sc and dc? Thanks! You work into the previous sc and dc. Because you are changing the stitch you start with, you will be working a dc in to a sc, and a sc into a dc. Does that make sense? Yes, and I figured it out. Just had a slight blonde moment. Haha. Thank you for the pattern! The hat turned out lovely! We kind of see my line where you have to join the last stich to the first one. Do you have some tips to not see it ? yes, the seam will be visible. I don’t have a tip to make the seam invisible, but if you find one, I would like to know! Where do you get your tags for your hats? I’ve not used this yarn before… what is it similar to that I might find in store? (something more main stream like Lion Brand, or Red Heart?) Thanks!! Red Heart Soft would be a great option! Super Cute! Think I might make this one! Thank you!